The system (BB-3?) is now well marked at 1002 mb and is Located just South of Parlakimidi (Odisha) n the Sea. Expected to cross land Early Monday morning near the North AP/South Odisha coast, near Chatrapur. Prominent rainfall in Odisha on Sunday (daytime till 8.30 pm IST) : Balasore 107 mms, Bhubaneshwar 93 mms, Puri 64 mms, Gopalpur 58 mms. Kolkata had a rainy day, max 32c, with 8 mms at Alipore. Delhi Sjung had a dust storm on Sunday evening. The odd 50% chance for a storm in Delhi to disturb the PM oath ceremony. A new Low forms off the Odisha Coast. Situated at 18N and 87E, it is about 1002 mb. Arguably, it is not BB-2 as apparent. BB-2 had dissipated, as shown in our morning post chart. Simultaneously, the predicted Low was mentioned few days back. 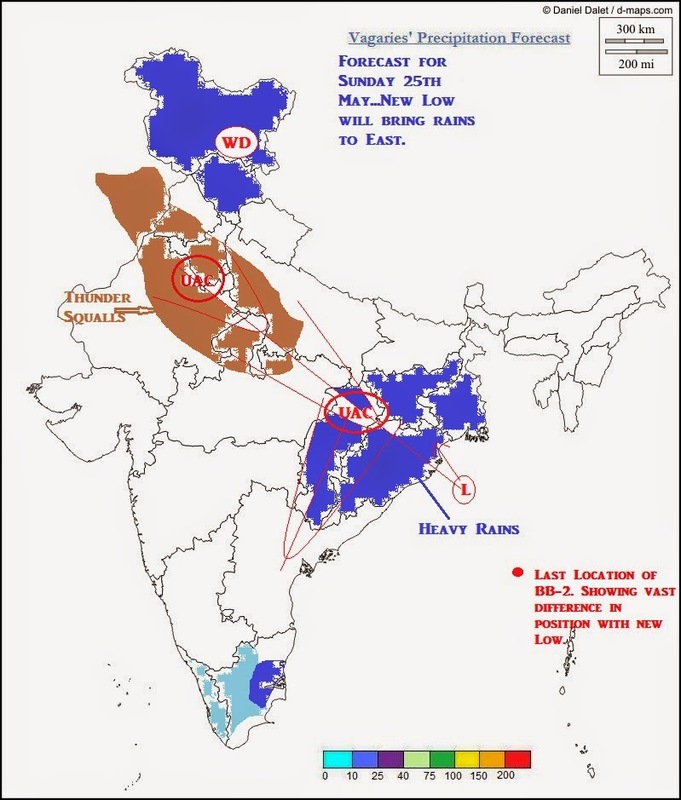 It has formed in the trough running across North MP thru Jharkhand and Odisha. Another point worth noting is that last mentioned location of BB-2 was 16N and 91.5E, barely 24 hrs ago...and the new Low is located at 18N and 87E, an very odd position for BB-2 to have "jumped" to (if it was the same)). Low will move inland thru Northern region of Odisha, and due to prevalent moisture, bring very heavy rains in North Odisha and adjoining Bengal. Due to the UAC in the WD trough, Punjab, Haryana and Parts of Delhi NCR can get thunder squalls on Sunday. As the trough weakens, Monday would see isolated thunder squalls popping up in North Rajasthan, adjoining UP and parts of Delhi NCR. Monday may see Thunder Squalls with rain in parts of Delhi NCR. Storms may drift into the Southern regions from adjoining areas surrounding South Delhi. Monday's swearing-in Ceremony of the Prime Minister may see a 50% chance of a thunder squall, with gusty dust raising winds. Partly Cloudy day. Rajesh sir predictions are bang on target. Kolkatans are finally having pre monsoon showers from the morning as indicated by him few days back. Sir, what is the outlook for the Arabia sea branch of the monsoon? Interested to get any insight abt when vidharbh and west mp will see monsoon rains. Rentachintala recorded the highest maximum temperature of 47 degree Celsius in the region. What about precipitaions chances at CENTRAL TAMILNADU? Odisha battered ! Rainfall ending 8.30am today. sir, it rained today in nagothane roha taluka raigad dist. It started raining at 5:30 and ended at 6:10. can you tell will it continue to recieve showers. sir it rained much days before but you told pre monsoon rain will start after 1st. can you give me some information and some forecast in north konkan.will it rain tommorow. Today evening sudden sky turn dark with strong winds from NE and then came moderate to heavy rain for 20mins in Badlapur.